This Workshop focuses on the cutting edge advances on 3D Printing, 3D Bioprinting, Digital and Additive Manufacturing approaches for Flexible Organic and Printed Electronics, Healthcare, Wearables, Automotive, etc. and for the fabrication of novel nanomaterials in advanced device architectures. As the world of 3D Printing is evolving, electronics are becoming a new key player. Functional elements such as sensors, biosensors and switches are now being integrated into 3D printed products, paving the way for exciting new markets, applications and opportunities. 3D Printing also encompasses a variety of different manufacturing processes. The processes are all primarily additive, with materials being deposited only where needed, as opposed to traditional substractive processes, like machining. This results in significantly less materials' wastage, which keeps costs and environmental impact down. Also, this workshop connects the Manufacturing with In-Line and Real-Time Monitoring Process and Control approaches to enable low-cost and high-volume manufacturing of Organic Electronic Devices. 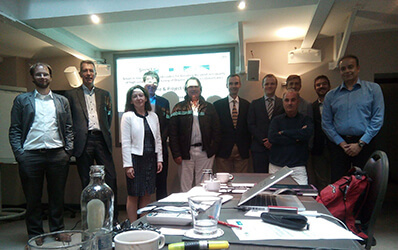 HOPE-A together with NAMEC-Cluster, Nanotechnology Lab LTFN and the NANOTEXNOLOGY 2018 Organizing Committee, organize a Special Workshop on EU Projects on Nanotechnologies & Advanced materials for OPVs and Perovskites gathering coordinators of EU Projects, Technology, Industry & Market experts. HOPE-A is expanding its strong worldwide network by signing a Collaboration Agreement with the Chinese Association "Innovation Alliance of Printed Electronics of China - IAPE"! This is the 5th Collaboration Agreement HOPE-A has signed, following the MoUs with Organic Electronics Saxony (OES), the Center for Organic Production Technologies - N. Rhine-Westphalia (COPT.NRW), the French Printed Electronics Association (AFELIM) and the Japanese Printed Electronics Association (JAPEC). HOPE-A members Nanotechnology Lab - LTFN and OET participated with presentations and a booth at Emerging Technologies 2018, Shanghai China. 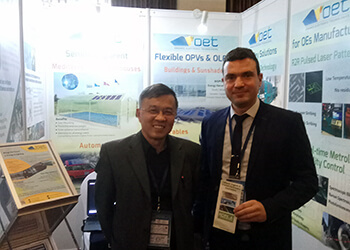 In the photo above, Mr. Antonis Theodosiou (right) representing HOPE-A with Prof. Zheng Cui representing the Innovation Alliance of Printed Electronics of China (IAPE). The CORNET Kick-Off Meeting took place on Friday 26th of January heralding the official start of this exciting project! CORNET is the H2020 Project "Multiscale modelling and characterization to optimize the manufacturing processes of Organic Electronics materials and devices", and HOPE-A as one of the CORNET partners will be disseminating and managing its progress and innovations! Nanotechnology Lab LTFN and OET, members of HOPE-A, will participate at Emerging Technologies 2018, on 24-26 Jan. 2018, at Shangai, China. The conference is composed of four themes: "2nd Printed and Flexible Electronics China 2018", "7th China International OLEDs Summit", "3rd China International Quantum Dots Summit", and "Vehicle Display China 2018". Visit us at our booth No. A3 at the Exhibition area and find out more about our activities! You can find more information regarding the event here. HOPE-A will be participating in the EC funded Horizon 2020 Project CORNET which is starting to operate on the 1st of January 2018. “CORNET-Multiscale modelling and characterization to optimize the manufacturing processes of Organic Electronics materials and devices” was granted successful under the Horizon 2020 Call NMBP-07-2017and will be running for 36 months. HOPE-A will be one of the 11 participants in CORNET, together with the Nanotechnology Lab-LTFN (Coordinator) of Aristotle University of Thessaloniki, Greece, the University of Surrey, UK, the University of Ioannina, Greece, the Centre National de la Recherche Scientifique, France, Fluxim, Switzerland, AIXTRON, Germany, the National Physical Laboratory, UK, Organic Electronic Technologies (OET), Greece, Centro Riserche Fiat, Italy, and Granta Design, UK. CORNET will develop a unique EU Open Innovation Environment covering the triangle of manufacturing, modelling and experimentation in order to optimize the Organic/Large Area Electronic materials, materials’ behaviour and nano-devices (OPVs, PPVs, OLEDs) manufacturing processes. This will strongly impact the fast and reliable development of new materials and tailored OE devices and systems for industrial applications (e.g. automotive, greenhouses). CORNET will develop an Open Innovation Environment Platform and a sustainable Database for documentation of citable and industrially accepted protocols for material & device characterization, modelling and manufacturing and will establish strong links with industrial associations and EU networks to increase the speed of Organic Electronic materials’/devices’ development and push-through standards for adoption by the industry worldwide. The CORNET Kick-Off Meeting is arranged to take place in Brussels on Friday 26th of January 2018. HOPE-A participated in ICT Proposers' Day 2017 - the biggest networking event on European ICT Research & Innovation with a special focus on the Horizon 2020 Work Programme for 2018-20 Calls. ICT Proposers' Day took place on 9 and 10 November in Budapest, Hungary. During the Face2Face Brokerage Event, HOPE-A met, also, with potential partners in pre-arranged face to face meetings. You can view the press release (in greek) here. Below you can find some of the press clippings about the Smartline press conference.